LuLu*s shares my love of all things cute so today I am giving away a $100 gift card to LuLu*s for one lucky winner to have their own mini summer shopping spree. What summer items have you been searching for? Cute sandals? Tank tops? Flirty dresses? This just might be your lucky day! To enter, just leave a comment with a link to your favorite LuLu*s item and a winner will be drawn at random on Friday, May 23rd. Good Luck! Categories: Giveaways | May 16, 2014 by thebandwifeblog. Love your purse too! Thanks for the giveaway, Laura! I love the maxi dresses from LuLu’s, especially the sunset serenade dress. Would be perfect for my tropical getaway next year! I’m obsessed with maxi dresses and lulu’s has a great selection. I think my favorite would be their Darling Justina Seafoam Color Block Maxi Dress. This is shift dress is adorable, although I’m pretty sure it’d end up being a shirt on me. This T shirt and the same style tank top! I really like the MysteryTrain Black And Cream Print Purse! It looks perfect for summer and fall! I love the shape and color of this little dress, it’s so flattering! I love these adorable wedges! I love this pleated ivory midi skirt! I have been loving the whole high-waisted trend….really want to try it!! I’m really wanting some easy summer dresses…somehow I’m missing even a single one of those. Love this tank. It’s surprisingly hard to find good basics! obsessed with this dress! too bad there’s only one left… will probably scoop it up before the contest is over, ha! How generous! Thank you for the opportunity! Mint and flowy is perfect for the summer! I’ve been wanting casual shorts—these are perfect! the JOA No Worries Grey Print is super cute!! I just got engaged and am in serious need of white dresses 🙂 would LOVE this one! Bling to Light top. HELLO! So pretty! I love the flowy “Near Myth” dress. Perfect for summer festivals! I’ve been shopping at Lulu*s since high school, believe it or not! Absolutely love everything I’ve ever purchased from shoes to dresses! I just realized that I only have one pair of shorts that fit since I lost weight and am TOTALLY ogling the Scallop Town Girl shorts in black. Ooops! I didn’t post a link in my last comment. I’m bad at following directions. I saw a dress similar to this one on Pinterest and just fell in love with it! I love this BB Dakota skirt http://www.lulus.com/products/bb-dakota-goodwin-floral-print-trumpet-skirt/143778.html! SO cute! They’re the perfect way to jazz up an outfit! I’ve been wanting a pretty, simple, feminine white dress for my summer wardrobe. This maxi dress: http://www.lulus.com/products/in-your-dreams-ivory-maxi-dress/134338.html and this lace dress: http://www.lulus.com/products/white-crow-chime-cream-lace-dress/151586.html are perfection. I need a pair of lighter boots for summer, my wardrobe needs them. Thanks for the opportunity, Laura! I have been eyeing the ‘That’s a Wrap Blue Long Sleeve ‘ dress by Honey Punch! This would be the perfect dress for those special occasions when I want to look effortlessly chic! So affordable too! This prairie top is amazing, but this fringe swim cover is my summer spirit animal. Loving the neckline on this dress!! Thanks for hosting a giveaway! Love these for a summer afternoon when it’s time for a pedicure! Love the blog and your ABD projects! I’m attracted to dresses and skirts like cats are to tuna, but THESE overalls though!!! http://www.lulus.com/products/white-crow-orion-distressed-denim-overalls/143842.html . Because I need another dress like I need a hole in my head, I think these cuties would [should] join my dresses in the closet this summer! Love their Raise the Stakes Mint and Grey Dress. So cute and comfy looking! Perfect for summer! This maxi is so cute! I’ve been on the hunt for a good new one! I can’t choose between the Can’t Go Wrong Navy Blue Dress and the Room for All Red Clutch … they’d look so cute together! Eep! In love with the At Long Last Beige Floral Print Maxi Dress (http://www.lulus.com/products/at-long-last-beige-floral-print-maxi-dress/126770.html)! Otter 2 yellow ankle strap sandals will make my feet so happy after being hidden in socks and boots all winter! So I might have an obsession with super high wedges and LuLu*s definitely has some amazing ones! I am loving the Bamboo Woody sandals! I own no strapless dresses, but I kind I want this one!! This dress is perfect for summer! What a brilliant give away!! Who doesn’t love lulus.com?!! PLUS, have you seen their festival fashion range?? I don’t know how it’s possible to choose just one piece. Sandals, strappy dresses, kimono jackets, sunglasses…. LULUS Exclusive Just a Twirl Navy, nautical striped dress!! Thanks so much for the awesome giveaway!!! Loving this cactus print top! I need this top like WOAH! Thanks for the opportunity! This is a hrd choice, but I do like the Pink Key Sandra Gold Moccasin Flats a lot! Also the How Dare Chic Blush Tank Top…..
this dress is EVERYTHING! i sure hope i win! I have a wedding to go to this summer and I would love to wear this dress! Although I tend to love everything from Lulu’s I think I would use this gift card to purchase this dress: http://www.lulus.com/products/snowy-meadow-crocheted-navy-blue-maxi-dress/149706.html for the bagillian weddings I’m headed to this summer. The perfect dress to dress up or down – swoon. Thanks for the giveaway! Love reading your blog. i need new summer swimmers! I love the Poppy Lux Esme Floral Print Shift Dress! A Mint sandal? Definitely a must for this summer. THESE [http://www.lulus.com/products/paprika-jarrow-tan-strappy-flat-sandals/144906.html] are the perfect summer sandal! I hope to win! It’s a super sweet mint lace maxi dress! Completely in love with this simple yet daring dress! The back is so unique! I’m in love, I’m in love, and I don’t care who knows it! It is so not something I would typically pick out, but I fell in love with the black clutch in your pic so much that I went and ordered it! Got the last one! Oh plz let me win bc I want these so badly with a cute shirt! I would love this dress for an upcoming wedding. I forgot how much I love Lulu*s! Love LuLu*s and love this color with a nice tan! 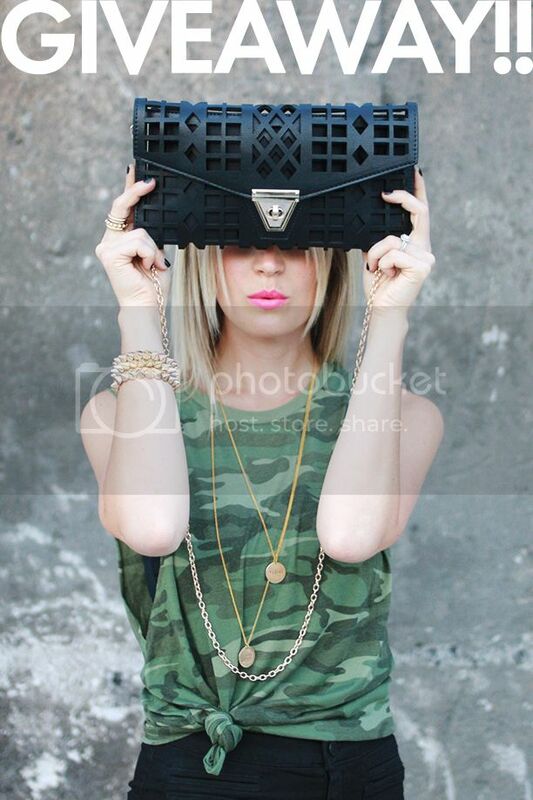 I love the geo clutch your wearing with the outfit! Sadly it is no longer available. I’m loving these cute little oxfords though, I pretty much love all their shoes! This dress is so amazingggg. http://www.lulus.com/products/c-label-cherish-1-multi-floral-print-high-heel-sandals/149250.html check these babies out! It’s hard to pick a favorite but I love this dress (http://www.lulus.com/products/fleur-real-navy-blue-floral-print-dress/154282.html)! Totally love any dress with sleeves they have! Especially the Stun House Teal Dress. It’s nice to have dress options for when you don’t want to wear something with just straps. Can I still win if my husband is best friends with your little brother? I would love some wedges! Grapefruit is one of my faves and cannot get over this purse! Would love the Make Art Not War tank. Thanks for the chance pretty lady!!! “Reverse Fruit-sie Roll Ivory Pineapple Print Romper” Pineapples are my jam! I’ve been eyeing this tote for so long! I check it almost everyday to see if it’s back in stock. Can I link two favorites? !